Hi PS Fans! My name is Andrea Boudewijn and I’m a baker of wedding cakes and confections who loves to shop at Paper Source in Pasadena and Beverly Hills. As a cake maker, I’ve often looked to Paper Source for tools I can use on my cakes. I know what you’re thinking: What could a paper store offer that could be used at a bakery? More than you can imagine. Everything in the shop is an opportunity to get a creative edge on my cakes, but today I want to talk about a tool I reach for and use every single day: The bone folder. If you’ve used one, you likely know its primary purpose: To aid in the clean, precise creasing of hand made notecards, origami, and other projects needing paper-folds. But in the shop, we use the comfortable, slightly-rounded face of this tool to smooth and heal our fondant and gum paste. The comfortable grip, organic feel and convenient shape allow us to rub out wrinkles, tuck fondant under a cake tier for a clean line, and on occasion texture the surface! Once we have the fondant and gum paste smooth and perfect, we dig into our collection of PS rubber stamps to decorate. It makes an image so much more precise to use a stamp (with edible food coloring, of course!) then paint over or around it for the desired effect. We also use them in a repeated pattern to create unique texture on our cakes. It takes a steady hand and lots of math to get it exactly right, but that’s our kind of everyday creativity. When we’re doing a suite of confections (‘sweet’ of confections? Blerrrg…), we love to arrange them on plates and stands on a dessert table then label them with PS bracket labels. Just pick a pretty font, print your labels with the name of the confection, and you’re off to the races! It’s a beautiful way to label desserts — either hang the tags from a ribbon or slip them into a placecard stand. Instant gorgeousness! 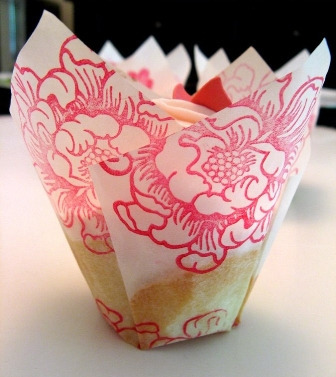 I love rubber stamps for making cupcake wrappers — it’s easy-peasy: Just flatten your wrapper paper, stamp on the exterior of the papers only (this means you can use regular ink), let dry, and wrap around your cupcakes. One last note on the bone folders: PS offers them at a much more reasonable price than you find from other vendors, if you can even find them. I keep handfuls of them in the shop so all the decorators can have access to one, and it warms my heart when I see one sticking out of someone’s back pocket in the bakery. It means that they keep it close and have come to depend on it as I have. Latest fave: Rubber stamps! All of them! Inspired to bake and decorate too! Lovely post. Thanks for sharing! The cupcakes made me want to bake some…don’t know if they’d turn out this pretty. Totally inspired and inspirational!!! Thinking outside the box at its best! Gorgeous! And what’s a good place to find cupcake wrappers? What a great way to introduce Guest Blogging…such an innovative use of products and those glorious confections. I hope Andrea has customers around the block…and media clamoring for interviews. Drooling here. wonderful….. ! thank you for the ideas and inspirations, andrea… Delish!!! what lovely ideas! they make me want to go bake and stamp and craft and everything. A charming story and a most lovely cake! 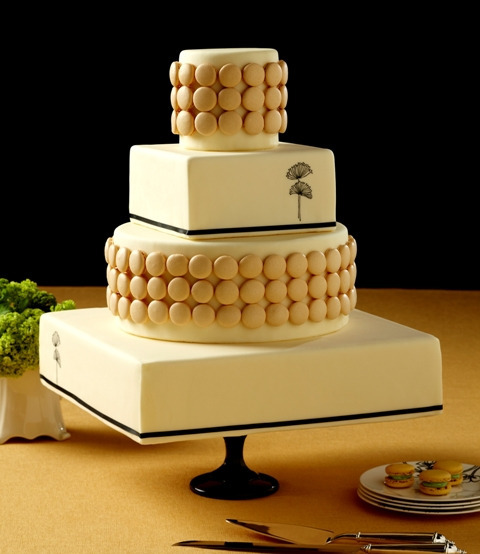 That simple elegance of that cake is amazingly beautiful! Talk about doing something creative everyday…Using things in unexpected ways. I love it! Hi, beautiful cupcakes! Can you please let me know how to fold the cupcake wrappers? Can you please let me know where I might be able to find the cupcake wrappers and also could you please let me know how to fold the wrappers!! They are beautiful!! !